First edition of Johnson's important Australia series. A beautiful first edition example of A. J. Johnson's 1861 map of Australia. This is the first edition and earliest state in the Johnson Australia series. Depicts the continent with good detail along the coast and a largely unexplored interior. Shows the Torrens Basin, the Stony Desert, Traveler's Valley, and the extant of Sturt's inland exploration. Tables in the corners show references to various counties in each provinces. A smaller table in the lower left provides a time line for the exploration of the continent, noting the dates associated with important navigators including Tasman, Arnhem, Hartog, Edel, Flinders, and others. Features the strapwork style border common to Johnson's atlas work from 1860 to 1863. Published by A. J. Johnson and Browning as plate number 88 in the 1861 edition of Johnson's New Illustrated Family Atlas. 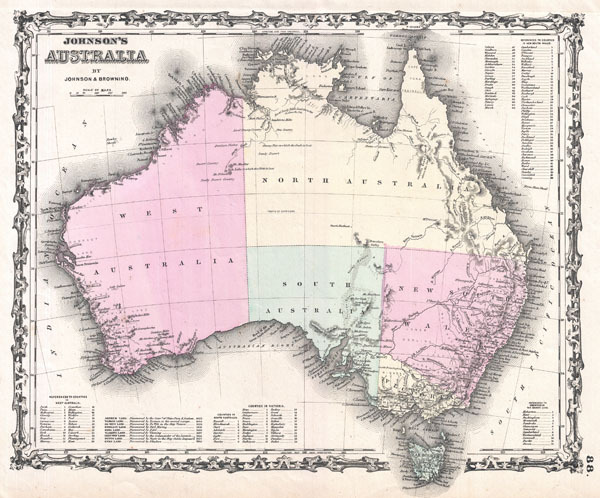 Though Johnson did print an 1860 edition of his atlas, it did not contain a specific Australia map. This is the last edition of the Family Atlas to bear the Johnson and Browning imprint. Very good condition. Light overall toning. Blank on verso.